A woman (identified as na Diwisa, i.e. 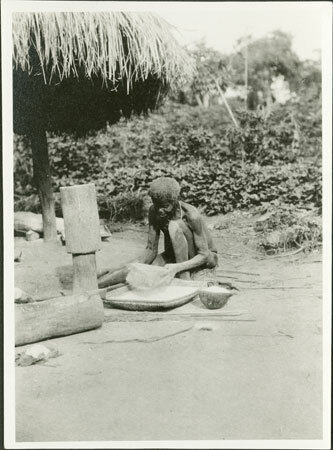 mother of Diwisa) outside a hut sifting manioc flour from an open-weave basket into a square flat basket beneath. Beside her stands a gourd of flour, a mortar (sangu) and another type of mortar, with a longitudinal section removed from the log to form a trough. Morton, Chris. "Zande woman sifting manioc flour" Southern Sudan Project (in development). 03 Jan. 2006. Pitt Rivers Museum. <http://southernsudan.prm.ox.ac.uk/details/1998.341.127.2/>.